It can be very difficult for your whole family when a loved one becomes terminally ill. You must wrestle with the inevitable loss of your loved one while also coping with your own feelings of immortality and reconciling the new family dynamic that will come. Figuring out how to provide the care your loved one needs during this time only creates more stress and hardship for your family. Americare Hospice and Palliative Care provides the compassionate and professional care that your loved one needs, which helps your whole family focus on what’s most important during this time: Spending as much time together as possible and making those final days as happy as possible. Americare Hospice and Palliative Care takes a conscientious approach to end-of-life care. We believe that everyone deserves loving compassion and support at every stage of life, and we are dedicated to treating people with the dignity and respect they deserve in their last days. We provide comprehensive, hospice care that puts patients at ease. Our team provides comprehensive health care, acute pain relief, symptoms management, alternative therapies, and spiritual counseling as requested. We have a long list of services that can be tailored to meet your family’s specific needs. 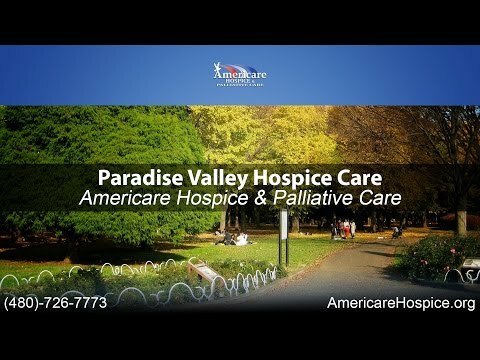 Our Paradise Valley hospice care services extend beyond the patients. We also offer ongoing support for family members, including individual bereavement counseling, seminars, ground programs, and a lending library. We strive to support the whole family, including the terminally ill patient and their loved ones. The primary reason that Americare Hospice and Palliative Care is so successful in caring for our patients is that we have a compassionate and dedicated staff of nurses, healthcare providers, and counselors. Our Interdisciplinary Group aims to meet your loved one’s physical, emotional, medical and spiritual needs. The team includes the hospice physician, nurses, hospice aides, social workers, spiritual counselors, volunteers and the bereavement team. All the members of our team are highly trained and experienced, and they are committed to providing the best care possible for all our patients and their loved ones. We follow the ethical and moral principles that are outlined in the Ethical and Religious Directives for Catholic Health Care Services, but our services are not specifically evangelical in nature and they are not offered exclusively to Catholics. We provide end-of-life services for patients and families of all faiths. Our team is ready to help you put together the care plan that your loved one needs to make their final days as comfortable as possible. Call us today to learn more about our hospice and palliative care services for Paradise Valley residents. What Should You Expect from End-of-Life Hospice Care?